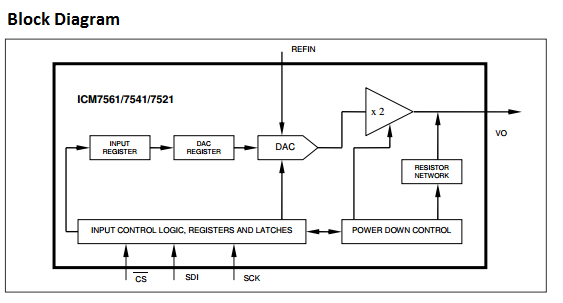 The ICM7561 is a 12-bit Wide Output Voltage Swing, Low Power, Single DAC respectively, with guaranteed monotonic behavior. These DAC are available in 8 Lead MSOP package. They have three Software-Selectable Power-Down Output Impedances (1 K Ohm, 100 K Ohm and Hi-Z) as additional safety feature for applications that drive transducers or valves.